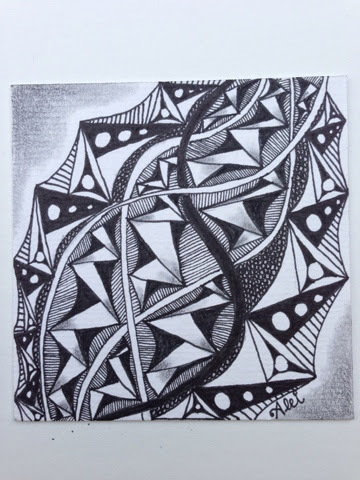 I'm not yet that familiar with the 'zentangle-world' and so for the first time I use a zentangle challenge. Challenge #184 of ' I am the Diva ' gives us the pattern ING to work with. Very nice use of ING. I like the criss-crossing ribbons and the different ways you have filled ING. Oh, nicely done! Love the twisty feel! This is a wonderful tile. Delightful combination of ING and Quib. You definitely went outside the box. Look forward to seeing more of your work. Very nice tile. Great contrast to help provide the depth. Like the simple line embellishment around ING inside the Quib. Alei this is beautifully done! Welkom in deze wereld! Ik hoop je hier vaker te 'zien''. Je tile is prachtig! Great work Alei. I love the tile as a whole. Great work putting these two together! I love your contrast too! Thank you all for the Nice reply !